Figure. Flow diagram for the systematic review from the Preferred Reporting Items for Systematic Reviews and Meta-analyses statement. Objectives To compare the morbidity, pain, cosmesis, and cost-effectiveness of single-incision laparoscopic cholecystectomy (SILC) with standard laparoscopic cholecystectomy (SLC). Data Sources Existing literature in MEDLINE through July 31, 2011. Study Selection We reviewed all studies identified through MEDLINE. References were cross-checked to ensure capture of cited pertinent articles. Case reports and series of less than 4 cases were excluded. Data Synthesis In total we analyzed 49 studies, including 2336 patients. Seven studies consisted of randomized trials and 11 of case-matched control series (compared with SLC). The technical aspects of SILC were not standardized. Median follow-up time was 4 weeks, although 27 studies (55.1%) reported no follow-up. The overall median complication rate was 7.37% (range, 0-28.6%), and the overall rate of biliary duct complications was 0.39%. Postoperative pain was similar or worse in SILC compared with SLC in 10 of 13 articles reporting pain outcomes (76.9%). Six articles investigating cosmesis after SILC compared outcomes with those of SLC. Three articles demonstrated significantly improved cosmesis after SILC. Conclusions The perceived benefits of SILC compared with SLC are improved cosmesis and reduced surgical trauma. No definitive evidence suggests that such improvements can be gained by SILC. Complications are more common, may be underestimated owing to the lack of sufficient follow-up, and may be associated with a shift from safe practice. Surgery remains the mainstay of treatment for biliary disease, and Navarra et al1 first described the laparoscopic removal of a gallbladder through multiple ports in a single periumbilical incision in 1997. Single-incision laparoscopic operations have emerged recently for a range of benign and malignant disease as a putatively less invasive alternative to conventional laparoscopic surgery. The perceived benefits of single-incision laparoscopic operations compared with conventional laparoscopy include reduced wound pain, improved cosmesis, expedited return to routine activity, and higher patient satisfaction. 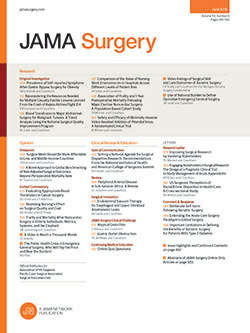 Although the feasibility of single-incision laparoscopic cholecystectomy (SILC) has largely been established,2 it remains unclear whether SILC represents an improvement in patient care, particularly because a large-scale adoption of such a technique would result in significantly higher costs in the treatment of gallstone disease. The aim of this systematic review was to critically appraise the available literature evaluating the efficacy and safety of SILC and make comparisons where possible with standard laparoscopic cholecystectomy (SLC). Because the strongest and probably the only arguments for SILC are the purported cosmetic benefit and reduced postoperative pain, we focused on these aspects in addition to examining the safety of the procedure. We undertook a MEDLINE literature search using the keywords cholecystectomy, single port, single incision, single site, single access, trans-umbilical, SILS, LESS, R-port, and Tri-port. We included adult human studies reporting outcomes of SILC and limited the search to any English-language article published through July 31, 2011. We excluded articles relating to single-incision procedures in a combination of operations unless data from the cholecystectomies could be extracted. We cross-checked the references in all articles retrieved to ensure capture of cited pertinent articles. A flow diagram of the selection process according to the statement on Preferred Reporting Items for Systematic Reviews and Meta-analyses is presented in the Figure. The primary end point was morbidity as a result of the procedure. Secondary end points included cosmesis, pain, cost, learning curve, and safety with regard to the critical view. In total, we analyzed 49 studies that met the inclusion criteria with a total of 2336 patients.3-51 These studies included 7 randomized controlled trials3,28,31,32,34,48,51 and 11 case-matched studies comparing outcomes with those of SLC. Most of the studies were case series. Two articles described fewer than 10 patients.20,23 Study size ranged from 4 to 297 patients (Table 1). Articles were published from 2008 through 2011. Twenty-seven articles (55.1%) recorded no follow-up. The remaining studies described follow-up at a median of 4 postoperative weeks (range, 1 week to 26 months). Surgical technique and devices varied. Devices described included 3 trocars inserted through a single incision, specially designed multiluminal devices, magnetic forceps, improvised surgical gloves as ports, and robotic devices. Frequently the same article described outcomes using various techniques during the study period, and this heterogeneity made objective outcome comparisons difficult. In total, 17 articles investigated postoperative pain.3,4,7,17,24,25,27,28,31,32,34,36,38,40,41,48,51 Pain scores used varied between studies to include the visual analog scale, narcotic requirements, and numerical rating scores (Table 2). The timing of pain scoring also differed between studies, varying from 1 postoperative day and the 2-week follow-up. The study by Marks et al34 incorporated a number of validated scores of cosmetic outcome. The 10-point photographic series questionnaire demonstrated significant improvements in wound satisfaction with SILC compared with SLC at 2 postoperative weeks and 3 postoperative months. However, this scoring system could introduce selection bias. The 21-point body-image cosmetic score also showed significant cosmetic improvement with SILC. However, the modified Hollander Incision Attribute Satisfaction Subscale score and the 8- and 12-Item Short Form Health Surveys showed no significant difference. A study by Ma et al32 used a 10-point score and found no difference between cohorts. The remaining article by Fumagalli et al17 asked patients to subjectively evaluate their satisfaction with the scar. They described 1 patient (4.8%) as unhappy with the cosmetic result. Three articles investigated the costs of SILC (Table 3).4,7,19 However, none of these specified a single-incision device. This finding may reflect the fact that a number of studies were performed with financial support from industry. Two studies reporting cost implications investigated an improvised surgical glove method and demonstrated significantly reduced costs compared with SLC.4,19 Both articles described the costs of the improvised surgical glove port as approximately one-quarter of the costs of SLC. In contrast, Chang et al7 used an unspecified SILC port and described costs as greater than SLC costs ($2547 vs $1976). No study performed with the aid of industrial grants declared financial implications. Eleven studies examined the effect of the learning curve on operating times (Table 3).8,17,18,24,26,32,36,41,46,47 The median operating time across studies was 80.75 (range, 40-186) minutes (Table 4). Among the 16 studies comparing outcomes with those of SLC, operating times were significantly increased in SILC in 9 studies.3,7,16,23,24,32,34,48,51 The remaining 7 studies contained a nonsignificant trend toward longer operating times. Most studies reported operations that were performed by a single surgeon or group of consultant surgeons for whom the specialist area was often minimally invasive surgery. Some articles, however, described the procedure as performed by residents. No study reported the nature of the residents' training. The overall median complication rate was 7.37% (range, 0-28.6%). Frequently, studies reported local complications, but these were not defined. The overall rate of bile duct injury was 0.39% (9 of 2336) across all studies (Table 3). Four leaks were secondary to accessory ducts. Because follow-up after single-incision procedures was highly variable and in many cases was not documented, this figure may underestimate this complication in terms of diathermy injuries leading to delayed stricturing of the bile duct. In articles reporting follow-up (1151 patients), 4 instances of incisional hernia occurred, giving an overall rate of 0.35%. Because length of follow-up varied and was only 2 weeks in some articles, this figure may underestimate true incisional hernia rates. A clear view or a “critical view of safety” in identifying relevant anatomy in the cholecystectomy triangle is essential to reduce the risk of ductal injury. Thirty-four articles (69.4%) did not explicitly describe the surgeon's perspective of views obtained. The article by Rawlings et al43 investigated specifically the critical view of safety in the SILC of 54 patients. The group used a 3-point grading system, namely, visualization of only 2 ductal structures entering the gallbladder, a clear view of the Calot triangle, and separation of the base of the gallbladder from the cystic plate. All 3 criteria were met in 64%, 2 were met in 24%, 1 was met in 6%, and none were met in 6% of cases. A study by Han et al18 reported outcomes of 150 SILCs performed using the improvised surgicalglove method. They recorded poor views of the Calot triangle in 34% of cases. In their case series of 12 patients using the 3-trocar technique, Tacchino et al47 also described poor views. Single-incision cholecystectomy was performed without the addition of extra ports (not including transparietal sutures) in 91.25% of operations. Reasons for additional ports included insufficient views, dense adhesions, insertion of a choledochoscope, bleeding, inability of the instruments to reach from the umbilicus, and gallbladder-duodenal fistula. One or more additional ports were required in a median of 8.55% of SILCs (range, 1.3%-66.7%). The rate of open conversion across studies was 0.43% (n = 10). Ease of surgery was also affected by the indication. Although in all studies cholecystectomy was performed for benign disease, the presentation differed between uncomplicated gallstone disease and acute cholecystitis. Seventeen studies included patients with acute cholecystitis.5-7,12-14,18,24,26,33,35,36,38,44,45,49,51 Patient characteristics, such as body mass index, previous upper abdominal surgery, and local anatomical considerations, added challenges. Many series reported cholecystectomy after bariatric procedures, which will inevitably become increasingly common as the number of these procedures increases. Twenty-six articles (53.1%) described the routine or selective use of transparietal sutures or other method of retraction to improve visualization of the Calot triangle (Table 2). Such sutures frequently resulted in the intraoperative spillage of bile and reduced the mobilization of the Hartmann pouch during dissection. Although a source of debate in SLC, the routine use of intraoperative cholangiography has been described as resulting in reduced ductal injuries. Intraoperative cholangiography was attempted selectively or routinely in 15 studies (30.6%). Success in performing intraoperative cholangiography was described in 66.7% to 100% of cases. Technical innovation within surgery is laudable, and the progress that results is generally a consequence of the quest to achieve optimum outcomes for patients. However, the advances in surgical technique must improve or at least maintain (and certainly not at the expense of) established safe principles. Perceived improvements in patient satisfaction (with cosmetic outcomes and reduction of pain and surgical trauma) must not increase complications or mandate deviations from safe surgical practice. The aims of this review were to assess morbidity and patient-specific outcomes after SILC and to make comparisons, where possible, with SLC. Advocates of SILC cite improved cosmesis and reduced surgical trauma (and therefore pain) as reasons for adopting this technique. Despite this, the patient's perspectives of cosmesis and postoperative pain have been poorly investigated and are difficult to assess in an objective fashion. In particular, the advent of the Internet makes this investigation difficult. Demands for the latest procedures are often based on information that is not based on evidence but rather is driven by commercial interests or the biotechnology industry. The most common complaint after SLC is related to the umbilicus. The SILC will inevitably create a bigger incision. Five studies3,17,28,31,51 objectively investigating cosmetic outcomes of SILC compared with SLC and with differing outcomes lead to no firm evidence of this assumption. Only the study by Marks et al34 used a validated scar questionnaire on which to base conclusions. The issue of cosmesis sidesteps the issue of whether surgeons should suspect patient dissatisfaction with SLC scars and whether this issue can be improved. A study by Bignell et al52 retrospectively investigated patients' satisfaction with cosmesis after SLC in 380 patients using a validated scar questionnaire. Among the 195 patients who responded, 92% were satisfied or extremely satisfied with the cosmetic outcomes after 4 years. This high rate of patient satisfaction with SLC is supported by other series.53 Improvements in cosmesis therefore seem difficult to achieve when high rates of satisfaction exist in established techniques. The assumption that implementing a single incision reduces postoperative pain is also not largely supported by the results of this review. Thirteen studies have investigated pain and, of these, (76.9%) report similar or worse pain after SILC compared with SLC. Increased pain with the SILC technique may be the result of lengthier operating times and subsequent abdominal wall tension that may improve with the learning curve. Difficulties arise in interpreting results because heterogeneity exists in surgical technique and the method and timing of pain scoring. The study by McGregor et al35 investigated the acute-phase response in patients undergoing SILC and compared it with the response in patients undergoing SLC. They found no difference in interleukin 6 and C-reactive protein levels between the techniques, indicating that surgical trauma may not be reduced in SILC. At present, SILC using industry-supplied ports may be more expensive than SLC, although none of the studies in the review provided any objective costs to support this possibility. In contrast, the improvised surgical glove technique was shown to be one-quarter the cost of SLC. Again, cost is difficult to assess when standardization of technique does not exist and series are published beyond the current learning curve. The large driving force behind SILC might have been commercial marketing; a significant number of the studies in this review are industry funded. This type of activity runs the risk of transforming surgical practice into a commodity offered to patients in various forms based on market research. The primary concern and source of skepticism for many surgeons considering the place of SILC is the frequent deviation from safe standards and the lack of evidence that such techniques offer any real benefit to the patient. However, the introduction of laparoscopic cholecystectomy nearly 20 years ago saw a rise in the incidence of ductal injury. However, the reaction by the surgical community was not to abandon the laparoscopic procedure. Instead, the American College of Surgeons reviewed causes of this complication and made suggestions regarding safer outcomes. The critical view of safety was defined by Strasberg and Brunt54 to aid dissection in relation to the cystic duct and common bile duct with the aim of preventing ductal injury. Questions remain whether the paradigm of conventional laparoscopic surgery can be further improved by reducing the number of ports used and whether any marginal benefits are cost-effective. The rates of bile duct injuries and minor or local complications in this review exceed those found in SLC. An overall complication rate of 7.37% and a ductal injury rate of 0.39% were demonstrated; because follow-up is frequently absent or extremely short in studies reporting outcomes, these figures almost certainly underestimate complications, particularly the delayed presentation of ductal injury. The rates of complications such as port-site hernia will also be underestimated, again owing to the lack of long-term results. The complication rates in this review are higher than those reported for SLC, in which ductal complications occur in less than half as many (0.2%) cases and the overall complication rate is less than 1%.58 However, 4 of the 9 reported bile leaks were secondary to accessory ducts. Complications are frequently not correlated with the surgeons' experience, including the authors' rate of complications with SLC, and may contribute to the varying rates observed. A possible cause of increased rates of umbilical complications may be the creation of circumferential skin flaps to accommodate the subcutaneous ports. This complication occurs with the technique of multiple fascial punctures from a single umbilical skin incision to insert multiple ports. The procedure may result in weakening of the fascia, seroma formation, and late complications, such as port-site hernia. In addition, the trocar type may influence the complication rate; this may become apparent as more studies reporting outcomes using different trocars are reported. Complications such as wound infection may be increased by the SILC technique. We believe that removing the gallbladder from the umbilical port risks anaerobic microbial seeding in the wound. The use of transparietal sutures increases the rates of intraoperative bile leakage and may contribute to microbial seeding. Limitations in drawing conclusions from the current published literature in SILC include study heterogeneity. Much variation in technical method, trocar type, instrumentation, transparietal suture use, surgeon experience, and the learning curve is reported. These factors may all contribute to the disparity in reported outcomes. When the discussion of operative technique takes place, the patient must be informed of the uncertainties of SILC. This conclusion is reflected in the recommendations made by the National Institute for Health and Clinical Excellence (http://www.nice.org.uk) in 2010. Outcomes from systematic reviews rather than market research must guide decisions about surgical procedures if we are to ensure that surgical progress is not dictated by commercial and industrial interests. Technical advances are essential to advance surgical practice, but patients must be protected from procedures and technologies with putative advantages until these can be proven in the context of properly conducted trials. Correspondence: Thomas C. Hall, MRCS, Department of Hepatobiliary and Pancreatic Surgery, University Hospitals of Leicester, Leicester LE5 4PW, England (tch2@doctors.org.uk). Accepted for Publication: January 4, 2012. Author Contributions:Study concept and design: Hall, Dennison, Metcalfe, and Garcea. Acquisition of data: Hall. Analysis and interpretation of data: Hall, Dennison, Bilku, and Garcea. Drafting of the manuscript: Hall, Dennison, Bilku, Metcalfe, and Garcea. Critical revision of the manuscript for important intellectual content: Hall. Statistical analysis: Hall and Metcalfe. Administrative, technical, and material support: Dennison, Metcalfe, and Garcea. Study supervision: Dennison, Metcalfe, and Garcea.